The March 2017 Mechanical Engineer (ME) and Certified Plant Mechanic (CPM) board exam results, conducted by PRC’s Board of Mechanical Engineering are released three (3) working days after the last day of board examination. Aside from the official list of passers, top 10 examinees, top performing schools and performance of schools are also posted. Brylle Pahimutang Gilbuena from University of Cebu in Lapulapu & Mandaue ranked first in Mechanical Engineering exams garnering a rating of 88.10%. He was followed by Nino Rey Jacoba Caraig from Polytechnic University of the Philippines - Maragondon having 87.80%. 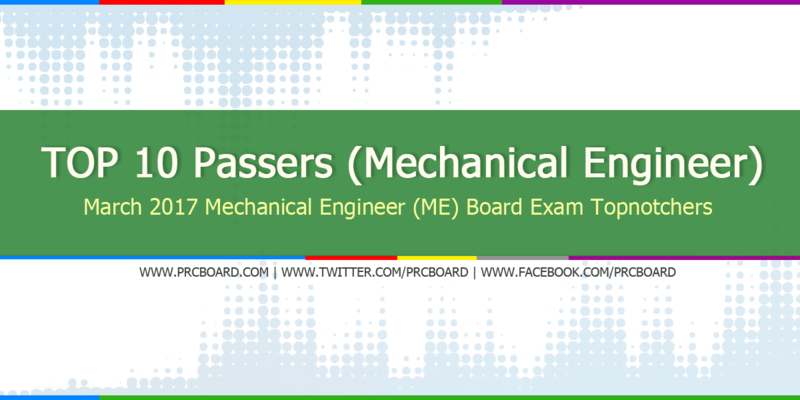 Below is the list of Mechanical Engineering top examinees courtesy of PRC. While most examinees are asking about the possible release date of results, as mentioned in the main page of this article, it will be out on March 22, 2017 (Wednesday).